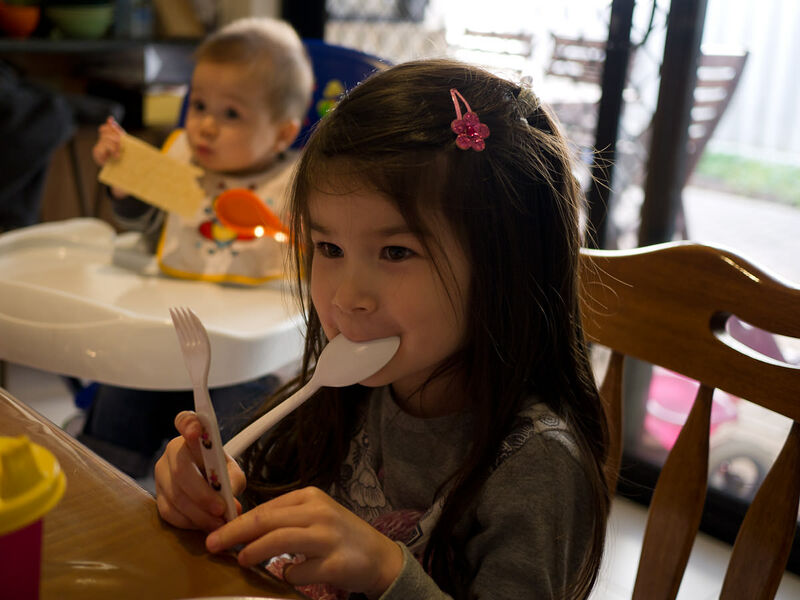 “I’m hungry,” my niece Ruby whispers, as she plays with her cutlery. “So am I,” I whisper back. She giggles and we grin at each other. It’s fathers day and we’re at family afternoon tea. We don’t really celebrate fathers day as such, but we’ve got a few treats for the dads in our family. 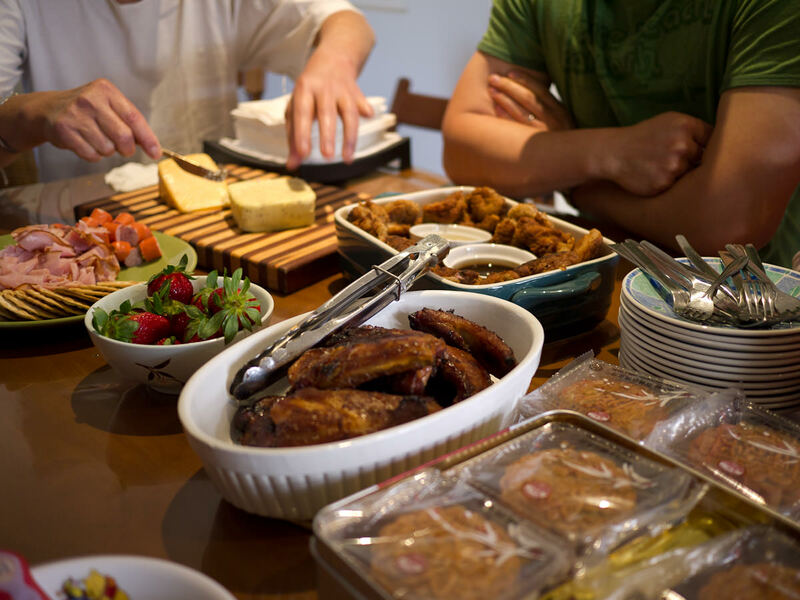 Everyone’s brought something delicious to share. As usual, we’ve catered to feasting proportions. Ruby’s younger sister Zoe has recently woken up from a nap. 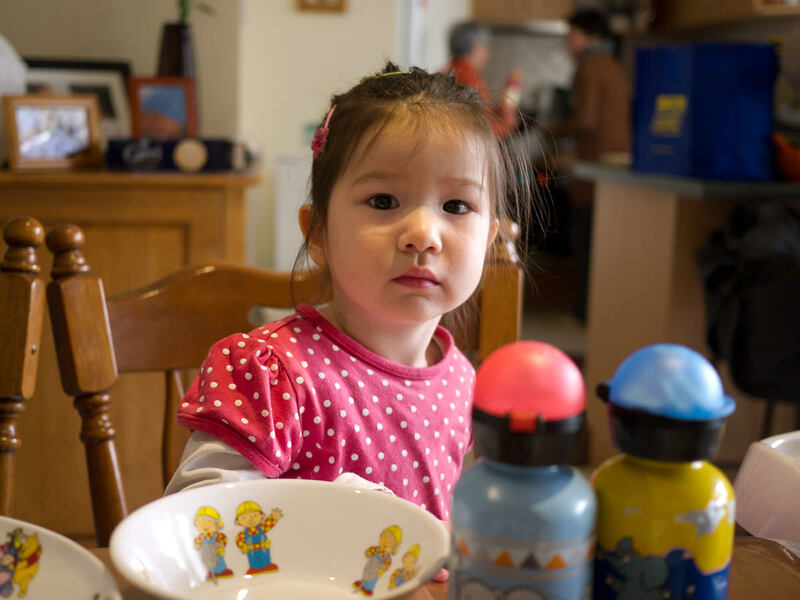 She looks a bit dazed to begin with and sits quietly watching as we place the dishes on the table. 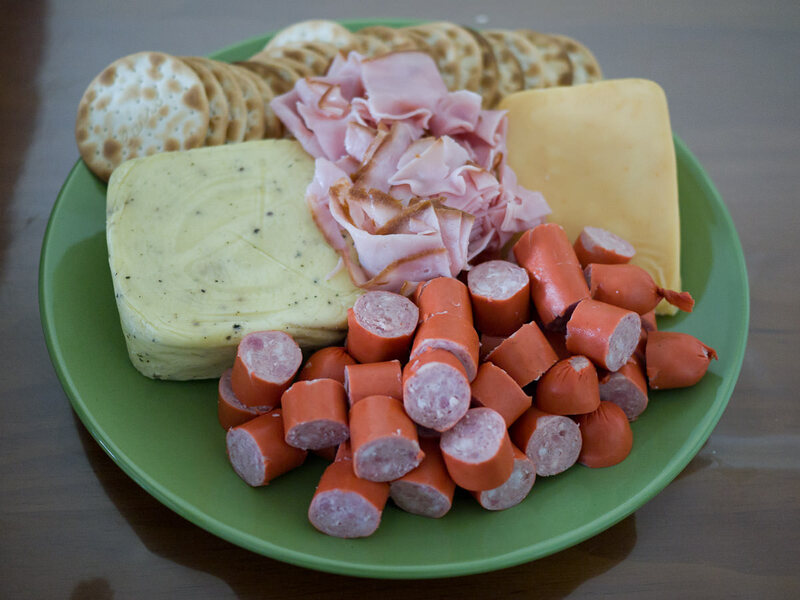 We have water crackers, sausage, ham and a couple of cheeses. One’s a pepper cheese, my dad’s favourite. Jac and I call our contribution to the meal “KFQ” (Kentucky Fried Quail). Jac has fried quail fillets coated with “Kentucky” seasoning (available at most Asian supermarkets). I serve the crispy fried quail with two sauces – Kewpie mayonnaise and smoky BBQ sauce, a combination I fell in love with when we cooked New York Times spicy supercrunchy fried chicken last month. The quail tastes like a leaner version of dark meat chicken. KFQ gets thumbs up from the second father sitting at the table, my brother, whom we all called Chicken Boy when he was little. He still has a voracious appetite for chicken and will always be Chicken Boy to me. 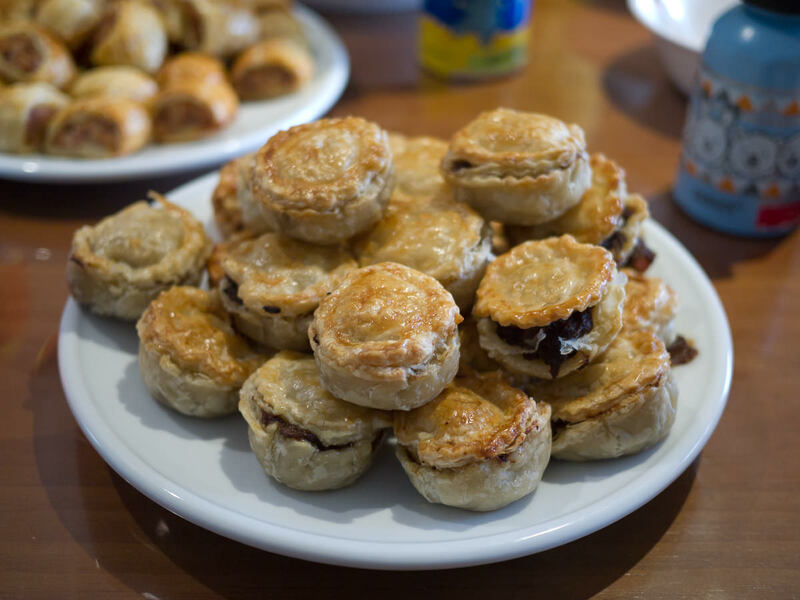 In addition to the mini sausage rolls, my younger sister Juji has made mini beef pies. She apologises for the pies that have leaked filling, but we assure her we don’t care about that at all. They look pretty good to us! 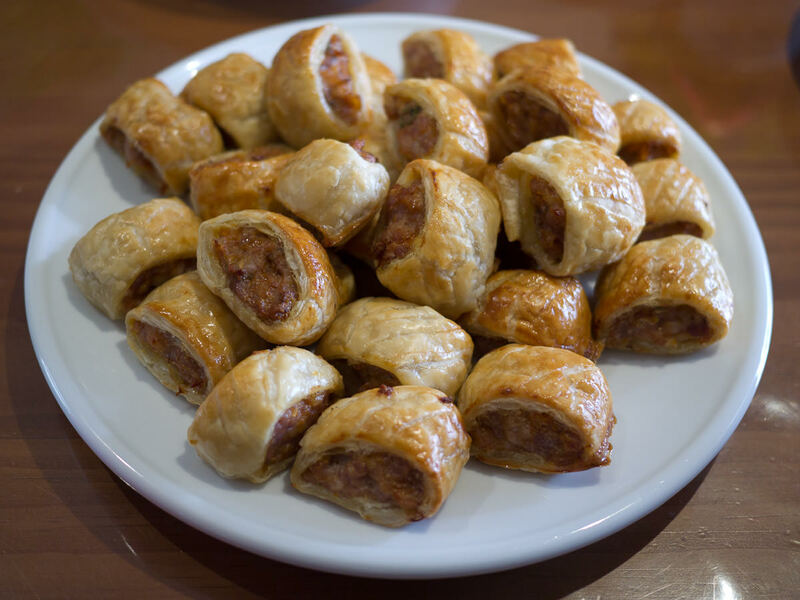 Juji’s pies and sausage rolls have become a firm favourite at our afternoon teas. I waste no time in squeezing tomato sauce on one of each. 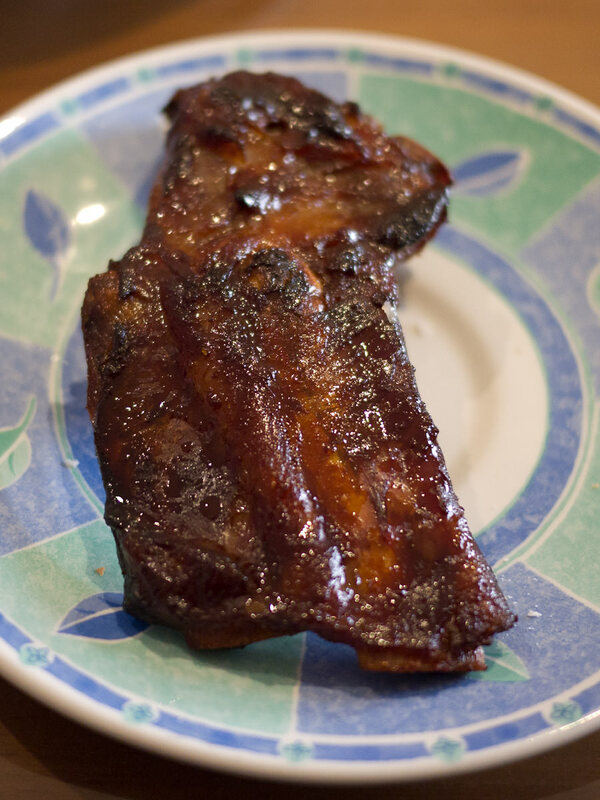 Mum’s cooked up pork ribs with char siu-style marinade. 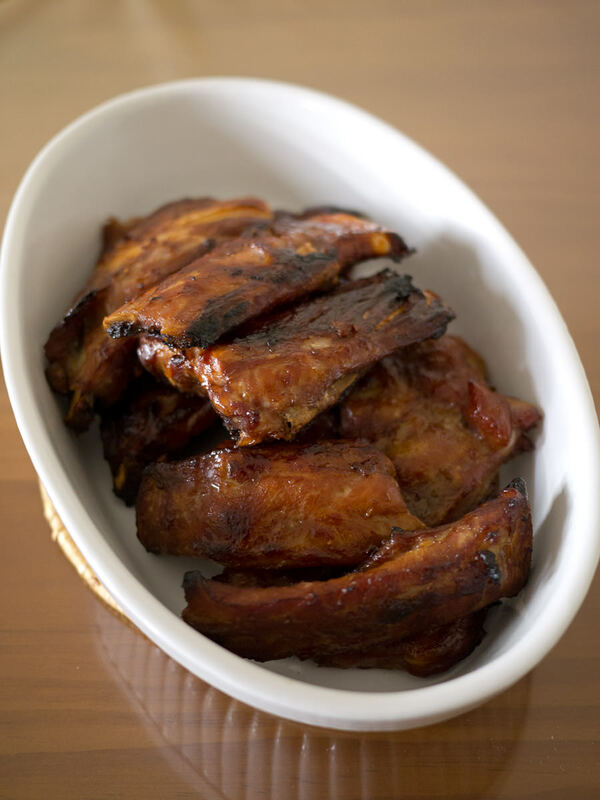 They aren’t the meatiest pork ribs we’ve eaten, but they are very tasty and we’re soon licking our saucy lips and sticky fingers as we happily devour them all. 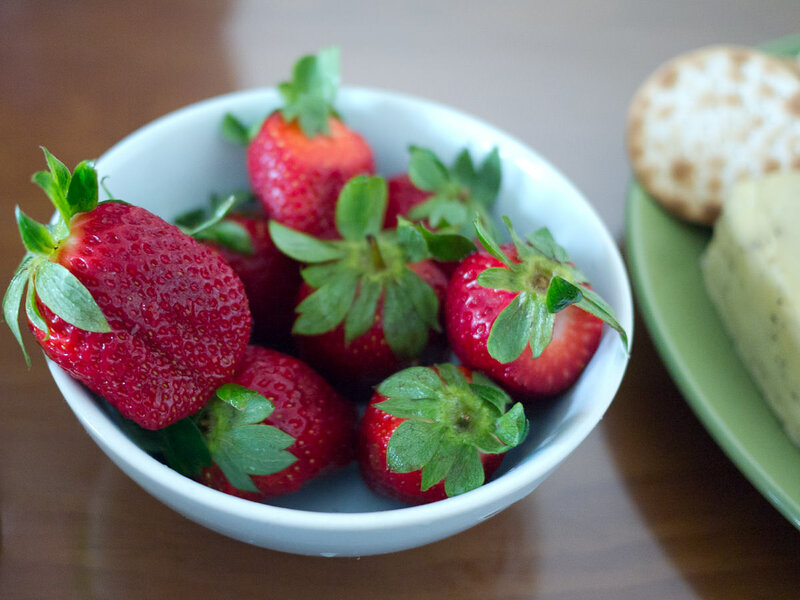 The fresh plump strawberries seem out of place in the midst of this protein-laden feast, but we enjoy them all the same. 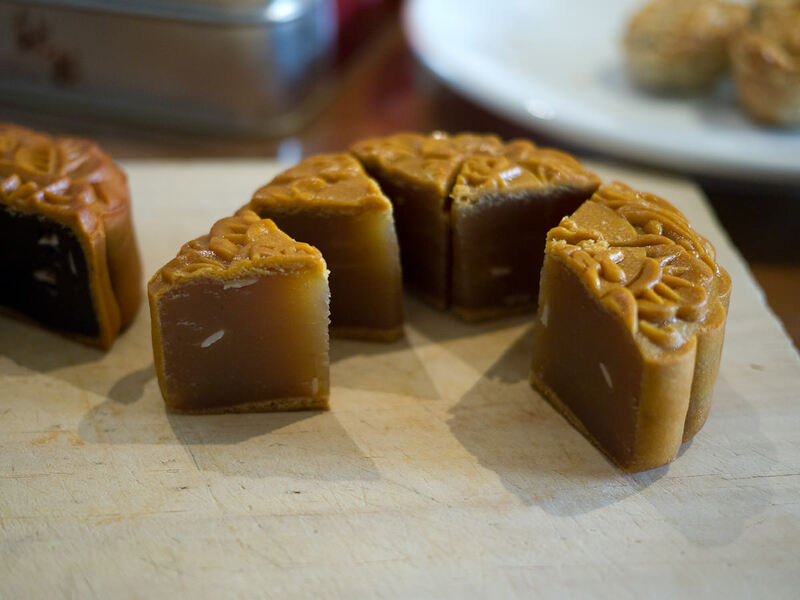 In the lead-up to the Chinese Mid-Autumn Festival, mooncakes have been on sale around Perth at Chinese groceries and restaurants. CW has brought two varieties for afternoon tea. 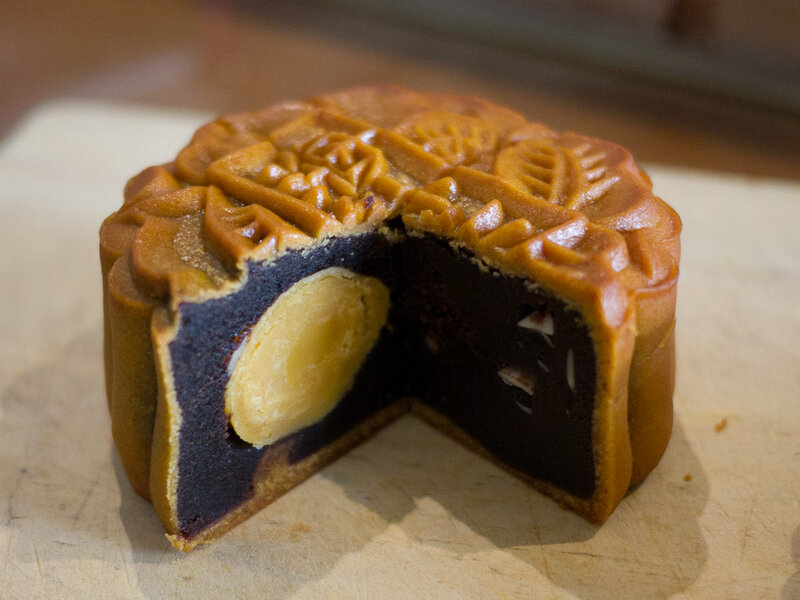 First, mooncakes filled with sweet red bean paste, with a salted egg yolk in the centre to represent the moon. I’m waiting impatiently to try the durian mooncake. 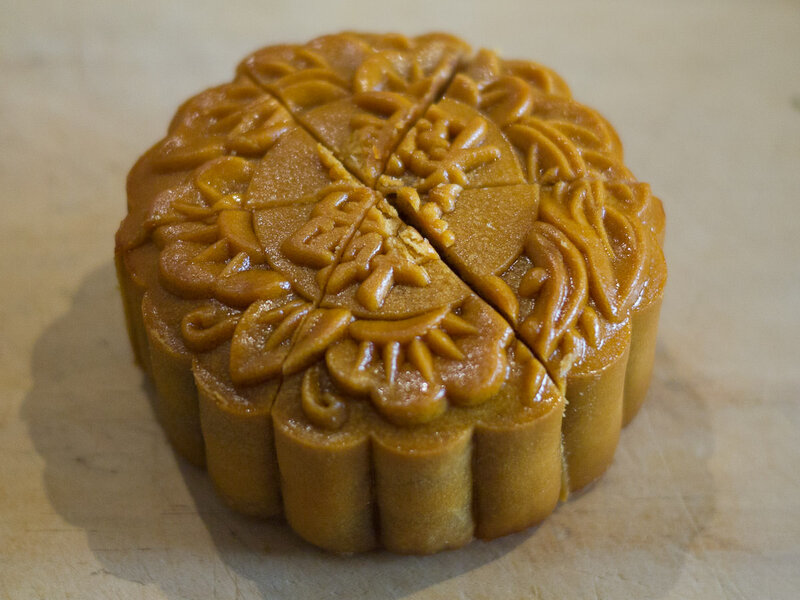 I can’t read Chinese but CW can and tells me that the characters on this moon cake say “Lau leen” (durian). As she cuts the cake into segments I’m sure I detect a whiff of durian. 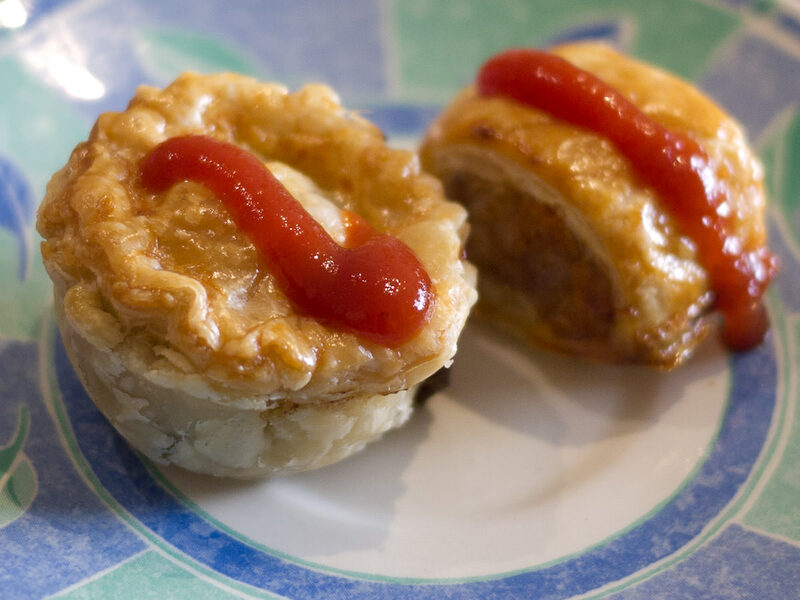 Zoe eats three sausage rolls, one after the other. My mum has made jelly for the girls and they enjoy it cold, straight from the fridge. 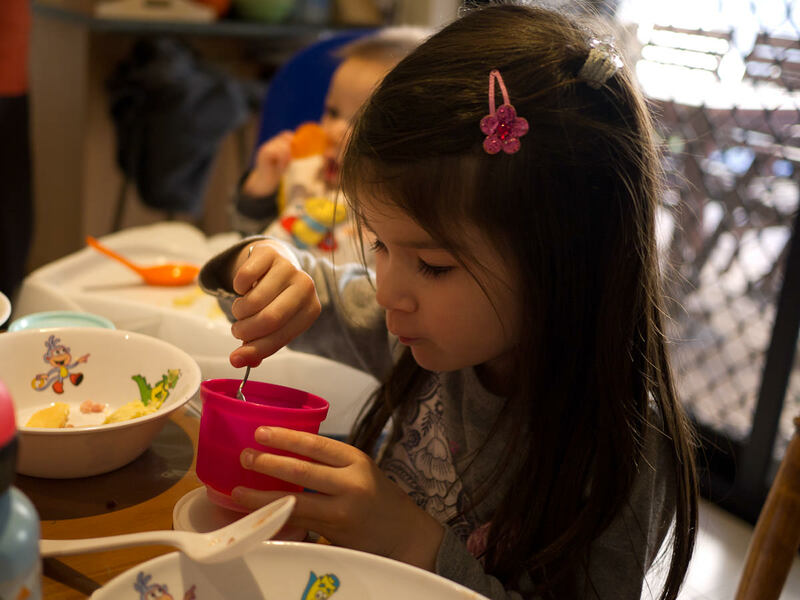 “It’s slippery!” Ruby declares, while Zoe pokes a finger into her wobbly jelly. 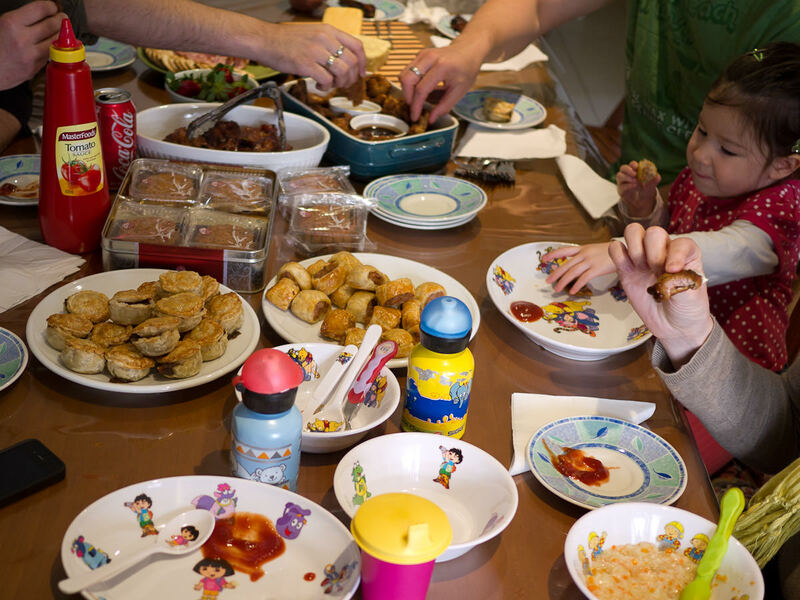 The youngest member of the family, my nephew Caleb, enjoys his own private feast. 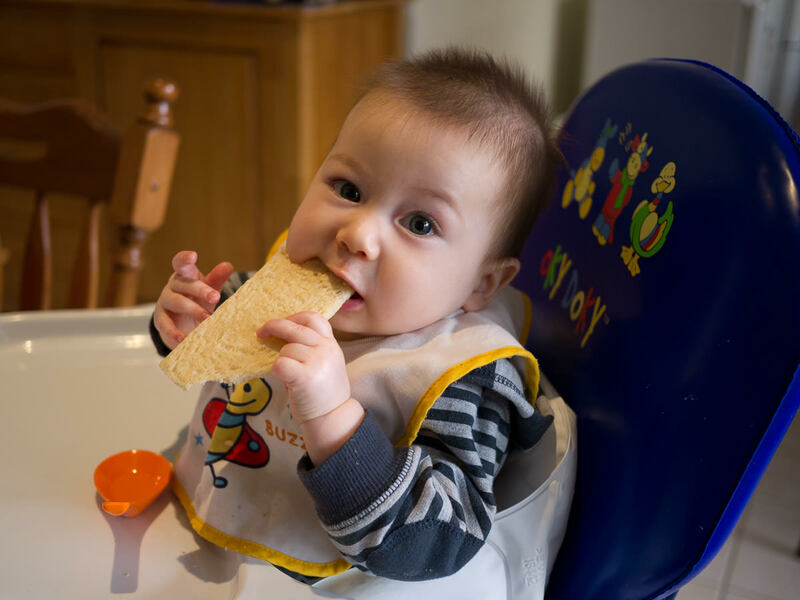 He wolfs down a bowl of rice porridge and munches on a Cruskit, his favourite snack. 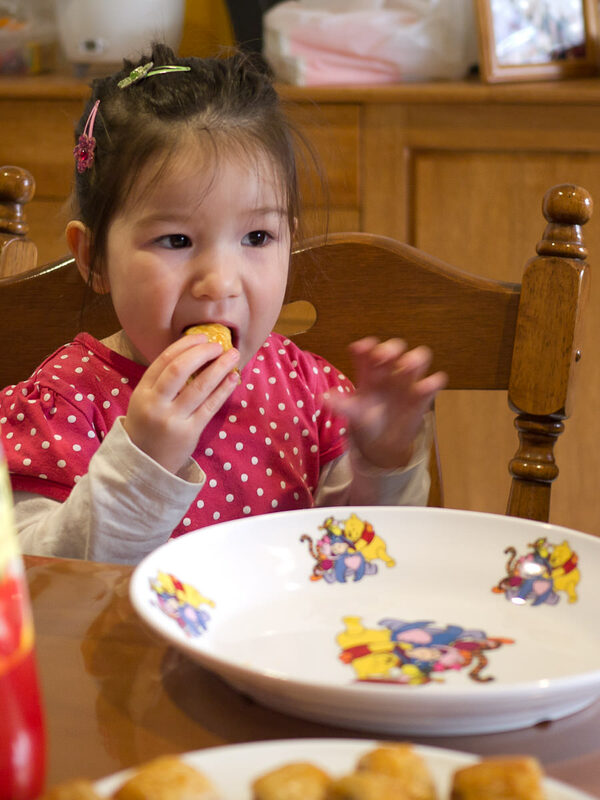 All signs suggest we have another good little eater here. Readers who follow me on Twitter and Facebook will know I’m a bit of an Angry Birds fan. This year, Angry Birds mooncakes are available in Hong Kong and Shanghai. I’ve been playing Angry Birds Seasons Moon Festival on my iPhone, though I must admit I am terrible at it! Angry Birds and mooncake fans, raise your hands! This week, I’m in Kuching, Sarawak, on my Malaysian eating adventure. Depending on availability of Internet access, I may take longer than usual to moderate and/or respond comments. If (even better) I’m able to get my hands on a prepaid mobile sim that includes data, I hope to keep you updated on Twitter and/or Facebook while I’m away. Can’t wait to share my photos with you when I get back.